Fascinating New Video from the 1945 Yalta Conference. The Memoir of Col. Joseph Gregory Mayton. By pure serendipity, I saw this video on ebay and speculated a bit less than twenty dollars to acquire it. It was worth it. The video is an oral history of Col. Joseph Gregory Mayton, who was chief of the Russian division of the OSS (Office of Strategic Services, predecessor to the CIA). Mayton attended the 1945 Yalta conference as translator for and liason of General George Marshall and was recruited by virtue of his fluency in the Russian language. Being the super-spy that he was, he was aware of the repression and atrocities perpetrated by Stalin and was anti-communist. This resulted in his being "blackballed" for an official position in Moscow and it is clear that the Soviets had a docier in him since, as you will see, they "knew about him" at Yalta. Most importantly, he took his camera with him and shot video of the conference, combining it with that taken by the U.S. Army Signal Corps into a remarkable 30 minute film that contains large amounts of previously unseen footage. Some of the video, obviously outtakes, shows FDR in a state never before publicly seen, something that would never have been permitted during his lifetime. By way of background, Mayton was born in 1897 in Russia, emigrated in 1918, spent some time in Houston (where he knew LBJ as as schoolteacher) and had some academic connection with LSU prior to his time in the service. He was discharged in October 1945. He was married, probably had no children and died in Altanta at the ripe old age of 97. This video was made in 1988, when Mayton was nearly over 90 years old, but he most definitely "has all his marbles" to put it in neurological parlance. There is only one glaring factual error in the video, FDR's whereabouts in March 1944,but that is really not diminish the importance and credibility of Mayton's dialogue. The host of the film, Ted Baehr, is presently director of a fundamentalist Christian film reviewing organization, but this is really all about Mayton. The video is in five parts since one can only put 10 minute segments up on You Tube (thank goodness for 21st Century technology). I hope you enjoy this fascinating, unique and informative historical document as much as I did. 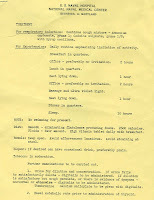 This memo is part of a group of documents recently received from the rarely viewed Walter Trohan papers at the Herbert Hoover Library in Iowa. The author "Dwyer" is Orville "Doc" Dwyer a Chicago Tribune reporter who had been with the newspaper since the early 1920's and earned his nickname by exposing quack medicine. The recipents were Trohan and two other high level executives at the paper W.B. "Don" Maxwell and Stanley "Little Giant" Armstrong. 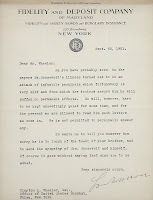 Dr. Louis E. Schmidt, referred to in the document was a urologist. Mr. Maloney was also a high level Tribune exec and Col. McCormick was the publisher. 2) It re-confirms Francis Perkins' observation that the FDR's seizures were occurring for years. 3) It shows, for the first time, that daughter Anna had observed them and understood, to some degree, their importance. 4) It shows that the seizures were misinterpreted as "small strokes" by those outside the inner circle of doctors and staff (at the least McIntire, Bruenn, Duncan, Craig, Watson, Lahey, Paullin and probably Hopkins) and explains the basis of Dr. Wold's allegation of multiple strokes in the 1948 Look Magazine article as leaked to him by Trohan. 5) It shows that Anna was likely unaware of FDR's prostate problems. Schmidt, a urologist, would almost surely have addressed this had he been told about it. 6) And, perhaps most importantly, It underscores the implications of FDR's medical debility upon his ability to function as commander-in-chief. It reveals what the those around FDR, including Marvin McIntyre, Jim Farley and Steve Early, knew about the Lucy Mercer affair. While the facts of 1919 appear to be somewhat incorrect, the overall implications are the same. 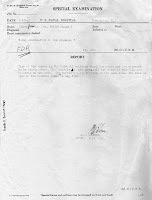 The report from Mike Reilly about the facts of April 12, 1945 are quite accurate and the document clearly shows that the Tribune sat on the Lucy Rutherfurd story for the 17 years until Jonathan Daniels made it public. There is perhaps even more yet to be found in Iowa! (ps. This post was written in October. I have since visited the Hoover libray and spent a most rewarding day researching the papers of Walter Trohan and Westbrook Pegler. 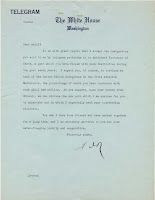 In fact, my conversations with the great Roosevelt biographer Geoffrey Ward lead me to believe that Geoff now believes that the version of the story about Lucy in the Dwyer letter is actually correct. 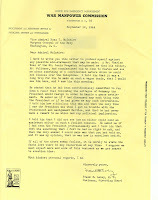 Of similar importance, this document also reveals that the Trib and Colonel McCormick sat on the Lucy story for 17 years until it was first publicly acknowleged in an article by Jonathan Daniels). Basically, Margaret "Daisy" Suckley's diary explodes many of the long-held myths perpetrated by Howard Bruenn. Here is a downloadable transcript of all the references Daisy made to FDR's health, many of which are discussed in greater detail in our book. By perusing the entries chronologically, one can appreciate a story within itself, documenting the true story of the deterioration of FDR's health as seen through the eyes of one who loved him intensely and without qualification. FDR shared many of his inner thoughts with Daisy, yet, by no means, all of them. Even with this "Closest Companion", he was far less than candid about his deadly secret, often leading the medically unsophisticated spinster to her own research. It is through Daisy that we learn about Harry Setaro (aka Harry Lenny) who was permitted to massage the president by virtue of his contacts with her. One untold piece of history only recently came to light. A 1945 check made out to Daisy by FDR to reimburse her for paying Setaro. FDR probably considered Setaro nothing more than a harmless amusement. He was far too medically sophisticated, especially with respect to polio, to believe that this retired boxer had any possiblility of improving his condition, though Daisy appears to be convinced of his value. Of course though, even Daisy had no real idea of the true nature of most of FDR's medical problems. Geoffrey Ward's book "Closest Companion" is essential reading to any serious FDR enthusiast. FDR always was acutely aware of his importance in history. As an autograph collector himself, he knew that when he attached his signature to a letter or document, it would likely be preserved. He took great pride in creating a written record of his achievements and there are many thousands of examples of his signature and handwriting in existence. When his handwriting began to deteriorate, likely due to a hereditary tremor further enhanced by multiple metabolic medical problems, he made an often valiant and concerted effort to minimize the changes. At the end, he simply could not do it. Here's two interesting examples. The first is his famous "FDR" monogram that he used on more casual correspondence. 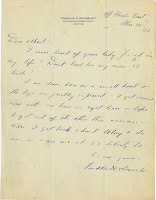 The first in a July 1941 letter Harold Ickes, referring to "the flu" at the time he was actually in the midst of his anemia that required at least nine transfusions. 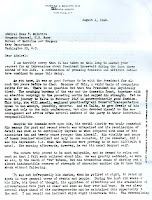 The second is a November 1944 communication to Adolf Berle. Another great way of comparing FDR's signatures is on his checks. Here's a number of examples documenting the dramtic deterioration in the last year of his life, including the last check he ever signed. The body of the checks are in the hand of Grace Tully. "He never told the truth, when a good lie would do"
The title of this post is a quote from Douglas MacArthur upon hearing of FDR's death. Truman put it more succinctly. "He lies" was his response to a 1944 inquiry about what FDR was really like. 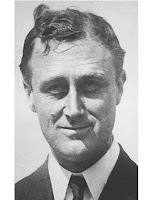 Here are some first hand examples, by FDR himself and his partner in deceit, Louis Howe. 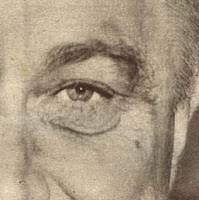 Even having seen literally thousands of photographs of FDR over the last three years and invariably directing my attention to his left eye, it took a while to sort out exactly what I was seeing. It is a matter of absolute certainty that the pigmented lesion above the eye was surgically removed between early 1940 and late 1941. The point, of course, was to do it slowly without (pardon the pun) raising any eyebrows that something was awry. It was a phenomenally successful effort, and likely reinforced Roosevelt's belief that, when it came to hiding his health problems, he could get away with almost anything (and he did!). Before Ross Mcintire began carving at the lesion, there had been some trauma to the area, with a scar within and lateral to the eyebrow seen in photos as early as 1915. 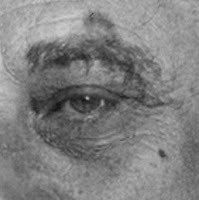 This scar shows up in some some photos in the 1920's, is especially well seen in photos of FDR at his first inauguration, and shows up throughout the 1930's. This was initially a source of confusion but it answers are a bit clearer. Geoffrey Ward's first book on FDR "Before the Trumpet" (p. 145) describes an incident where the nine-year old Franklin sustained a deep cut on his forehead from a falling curtain rod while on a ship with his father. The point was that stoic and proud FDR insisted that his father not be told, rather asking for a cap to cover the wound. This incident may be the source of that scar. It is also clear from a few photos that another well known skin lesion, the benign waxy mole on his right cheek was, at one time, a considerable cosmetic eyesore. This may also have functioned in sensitizing him to the appearance of his face. It is also apparant that, sometime in the late teens or early 1920's some minor cosmetic reduction was performed. The photographs below are ample testimony. The old scar continues to be evident in some photos after 1942. It could also be speculated that McIntire the old scar as a portal to treat FDR's mew and malignant problem. How Deep was the Cover-up? 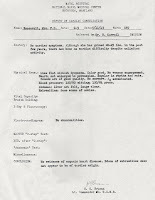 On the face it, a simple x-ray report on an unknown patient, this document tells many stories. Found in the archives of the Franklin D. Roosevelt library, it is one of the relatively few surviving medical records of the President. Exactly why Ross McIntire decided to separate this one from what must have been countless others is a matter of speculation, but we can make a highly educated guess. It is dated January 10, 1940. 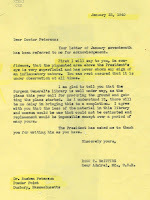 Just about the time a reknowned cancer doctor, Reuben Peterson, sent a friendly letter to FDR mentioning his concerns about the pigmented lesion over his left eye- a wake-up call that it something must be done so that it didn't raise concerns among other, less well-intentioned, observers. Roosevelt was about to attempt what no man had ever done, run for a third term as president, and even the slightest whiff of suspicion that he had a malignant disease would spell an abrupt end to that lofty ambition. 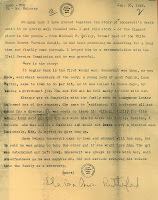 The handwritten annotations and typed interpretion were by Dr. Charles Francis Behrens, the navy's top radiologist. At the time, radiologists performed the dual function of interpreting films and treating patients, mostly with cancer, with radiation therapy. He was at the top of his field in both, authoring many scientific papers and editing the first textbook on the effects of radiation on the body, Atomic Medicine, in 1948. He would also be an integral part of the diagnostic team put together to treat Roosevelt in 1944, as noted by Howard Bruenn in his 1970 paper. Every existing x-ray report of FDR carries Behren's signature. Whatever was really wrong with Roosevelt, Behrens knew. His interpretations were the portal that all others relied on. The films were taken at the White House and transported to the Naval Hospital in the nearby foggy bottom section of Washington (near the site of the present-day Vietman memorial) by Mcintire's right hand man, George Adam Fox, to be read by Behrens. The text of the interpretation is revealing. "View of the siuses (sic) in the Caldwell position shows the antra and the ethmoids to be fairly clear. The frontals do not show well but there is possibly some haziness on one side. The turbinates are swollen on the same side. The lateral view of the frontal sinuses is negative." There is no secretarial signature at the bottom. That, the fact that no patients name appears, the mis-spellings and hand-written annotations indicate that Behrens generated the entire dociument himself. Even with an anonymous patient, it was far too sensitive to be seen by anyone other than Ross McIntire. The most telling aspect of the report are the words "on one side" and "on the same side". This is most definitely intentional, since leaving out such an essential point of information as the side of the pathology is something that any trained radiologist would never purposefully do. Almost surely, the problematic side was the left one but any written mention of the side of FDR's problem was strictly verboten. In summary, this fascinating document is more evidence that their was an active cover-up of Roosevelts melanoma as early as January 1940. On August 31, 1942, FDR made one of his "public" appearances (aside from the 29 secret ones) at the National Naval Medical Center at Bethesda Maryland. Here is a video of his speech at the dedication ceremonies. Ross McIntire is mentioned at the outset. 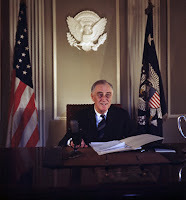 FDR took a special interest in the center, choosing the site and providing a rough design of the building. He laid the cornerstone in 1938. This video comes from the website of British Pathe www.britishpathe.com , the best and most accessible repository of FDR videos in existence. I showed it as part of my lecture on FDR's health at NNMC as the inaugural lecture in the Surgeon General's Lecture Series on FDR's health on November 7, 2007. An ongoing debt of thanks is due to surgeon general VADM Adam Robinson and naval medical historians Jan Herman and Andre Sobocinski. If you make a pilgrimage to Hyde Park to FDR's home, you will see that the cafeteria at the welcoming center there is named after his White House cook, Henrietta Nesbitt. There is a bit of underlying humor and irony here. By all reports, FDR hated Mrs. Nesbitt's cooking and much preferred that of his cook at Warm Springs, Daisy Bonner. Daisy was preparing FDR's last meal, his favorite souffle, when he was fatally stricken with a brain hemorrhage on April 12, 1945. The note that Daisy wrote on the wall of the Little White House that fateful day can still be seen there. FDR's favorite meal was Brunwick Stew, as prepared by Daisy. It was be served to him at as a surprise at the planned barbeque/minstrel show he never attended the afternoon of his death. We found this picture of Daisy, who died in 1958, in a rare African-American oriented magazine, Sepia (now at the FDRL). The relationship between FDR and the iconic father of American neurosurgery, Harvey Cushing, came about through the marriage of their children, James and Betsey. Betsey was FDR's favorite daughter-in-law, playing host to Britain's royal family during their visit to Hyde Park in 1939. The marriage lasted between 1930 and 1940, ending in divorce, and produced two children. Betsey Cushing then married John Hay "Jock" Whitney, and became one of America's greatest philanthropists and patron of the arts, leaving an estate reportedly over $700,000,000. Ironically, FDR and Cushing had another connnection. At the outset of FDR's fatal brain hemorrhage on April 12, 1945, Roosevelt's blood pressure soared to 260/150, a phenomenon seen as a consequence of a rapid elevation in intracranial pressure (basically, a reflex effort by the body to maintain blood circulation to the brain). This was first described by Cushing in 1902 and is known as the the Cushing response or Cushing's phenomena. I found the caption on this 1937 photo intriguing. As soon as I saw that FDR was avoiding the press because of a "sty" in the eye, it raised suspicion that perhaps something else was being treated. Further research yielded the fact that, of course, it was the left eye that had the "sty". After four years of researching this incredibly deceptive man, one thing becomes entirely evident- no public statement about his health can be taken at face value. All of the stories of "sinusitis" "flu" "intestinal flu" "grippe" "swamp fever" must be taken with the proverbial grain of salt. Knowing what we do tells us that we really don't know very much at all. Could they have been treating FDR's melanoma as early as 1937? Of course, but there is not a shred of direct evidence. Then again, there is not a shred of evidence that it was ever treated and we know with absolute certainty that it was. Any review of the pages and pages of visits to the White House doctor's office, essentially daily from late 1938, the mysterious trips and voyages, and the plethora of known deceptions we have already uncovered, tells us that we have only begun to unravel the many layers of smokescreen. The most exciting prospect of this book getting wide attention is that we have one last opportunity to "shake the tree" (without Dr. Bruenn to squelch it, as he did quite successfully in 1979). We are most excited to see what fruit may fall out. See for yourself. Here is the 1979 TIME magazine article published following the release of Harry Goldsmith's paper. Note, in particular, Dr. Bruenn's response. It is easy to see now that the keeper of FDR's deadly secret was lying through his teeth, but its taken fully thirty more years before we can finally expose these comments for what they were. Roosevelt was a great bluffer and a driver in command of the game, calling on this person to ante up, bet or fold up. Nothing delighted him more than a successful bluff, although he never seemed to suspect there was some hesitancy to win on the part of most of his opponents, including his staffers. He was most unhappy when one of his bluffs failed, almost childishly so. My delight was getting a pair, back to back at stud poker, a great favorite for him, and calling his bluff. One of the first signs of his declining health came when he became vacant and forgetful at the poker table and often had to be invited to make his play. Hopkins was uniquely lucky and played his cards for everything there was in them. Secretary Ickes, like myself, was not a particularly colorful player. Watson was a rather careless player, bent on thorough enjoyment of the game rather than results. Dr McIntire was a keen player and thoroughly intelligent. The President studied the players as much as he did the cards. We often caught him bluffing but throughout the trip there was a marked peculiarity in his playing. Invariably he lost the early part of the game and we would have him down several dollars. Invariably he made it up in the last three or four hands of the evening. We finally told him that the only way we could beat him was to break up the game and we were going to arrange to have a fire call about four hands before the finish. The President thought he was a good poker player. That opinion, however, was not shared by all those who played with him- and some of them should know. He lost more often than he won. All of us took particular pride and joy in winning from him, and nothing pleased him more than to win from us. As the president grew older, Doc McIntire insisted that the number of hours of card playing on his birthday be cut. From the all-night sessions which used to take place in Albany, they gradually shrunk to 4 A.M. then to 2 A.M., and finally, much to the President’s disgust, to midnight. He would complain about quitting early, but on a glance from Doc we would all insist, and if necessary just get up and quit. She remembers a time when he wheeled himself...unannounced … into the solarium where a taboo poker game was going on. Instead of a dressing down, the men were surprised by FDR’s request to be dealt in. The following comes from wordsmith and father of two world-class poker players, Richard Lederer. Because of paraplegia brought on by his polio, Franklin D. Roosevelt was unable to relax by taking long walks or playing golf or tennis. But he often had dinner with his poker-playing pals and then adjourned to a marathon session of cards. His favorite game was seven-card stud. Among the regulars were the Vice President, Speaker of the House, Attorney General, Secretary of Commerce, and at least one Supreme Court Justice. The President's secretary, “Missy” LeHand, served cocktails and often played in the game. One of the rules was that nobody could discuss anything serious at the evening poker sessions. The only thought was how to outfox the other players. From Doris Kearns Goodwin: During the war, he'd relax with marathon poker games with his cabinet. The only thing he thought about was how to beat these guys in poker. There's a story about an annual poker game he held on the night that Congress was supposed to adjourn. There was a rule that whoever was ahead at the moment that the speaker called to say Congress was adjourned would win the poker game. Well, he's playing one year, and it turns out that when the speaker called at 9:30, Roosevelt was doing terribly and his secretary of the treasury, Morgenthau, was way ahead. So Roosevelt took the phone and pretended it was someone else on the line. "Well I'm so glad you're calling, but we're in the middle of a big poker game." Then they kept playing and playing until finally around midnight Roosevelt pulled ahead. He whispered to an aide, "Bring me the phone." So he says into the phone, "Oh, Mr. Speaker, you're adjourning. How fine!" Then to his friends, "Well, boys, I guess I win!" Everything was great until Morgenthau read in the newspaper the next day that Congress had adjourned at 9:30. He said he was so angry he actually resigned for a few moments until the charm of Roosevelt persuaded him it was all in fun. In preparation for the many lectures I have presented to physicans, I prepared two slides based on available laboratory evidence at the FDRL and from information from Howard Bruenn's 1970 paper. The first slide documents the abrupt rises in hemoglobin level that are absolute confirmation of at least nine transfusions FDR received in 1941. The is no other physiologic explanation. Bruenn's notion that the anemia responded to Iron therapy, like many other of his assertions, is not viable. The second slide is a chart of FDR's weight in 1944-1945. The solid line is documented in Bruenn's paper. The dotted line is a reasonable estimate based on the countless reports of ongoing weight loss seen during three years of research. As all human beings who are driven and successful, Franklin Roosevelt had a constructively obsessive side to his personality. He was well as known collector. His world class collection if naval models and prints is presently on display in New York City. Obviously, he is also remembered for his stamp collecting, which afforded him the ability to escape from the pressures of his hectic daily life. After 1921, his obsession turned to rehabilitating himself from polio. Seeking every possible way of returning function to his polio-stricken muscles, he educated himself to the level of the finest physicians of the time. 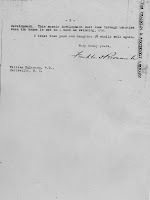 His passion for gaining and spreading knowledge in this area is well documented in his correspondence about polio with others, most notably a remarkable 1924 letter to a South Carolina physician, William Egleston, whose daughter had contracted the disease, and had sent FDR a letter about another of his afflicted patients. (pardon the poor reproduction). In his compassionate and intimate reply, Doctor Roosevelt offers his advice for treatment and lays out his philosophy about the disease. It is notable for a number of reasons. 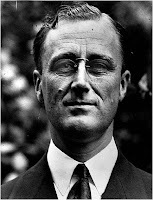 At the outset, FDR lays out an extremely (and uncharacteristically) candid account of his own case, recounting the onset of his symptoms and the early erroneous and harmful attempts at massage, followed by a detailed description of his present state of rehabilitation, at a level, not as a patient, but as one physician to another, essentially a consultation in contemporary Physical Medicine and Rehabilitation (a specialty which was yet to be founded), based on the "hundreds of cases" he had studied. His findings are, for the most part, as valid today as they were then, including a remarkably innovative way of documenting objective improvement, using the level of water he could stand in as measure of the ability of his thigh muscles (quadriceps) to support him. His views on bracing are revolutionary for the time and remain valid today. His feelings about the positive attitude needed to overcome disease is as sound a piece of psychiatric advice that can be offerred then- and now! In short, this letter demonstrates that, by 1924, Franklin Roosevelt had educated himself to the very highest level, that of the most learned physicians in the field, in the rehabilitation of polio. His passion and obsession extended so far as to risk the bulk of his personal fortune, against the advice of his family and friends, in an effort to turn Warm Springs into a word-class rehabilitation center. Interestingly, his fourth recommendation "sunlight- all the patient could get" may have had a bearing upon his development of melanoma (a concept, even today debated at the highest level by dematologists). His discovery of and effusive praise of Dr. William McDonald (see page 30 of the book) is even further testimony to his remarkable knowledge of and intense passion about his disease* Geoffrey Ward's wonderful biography of FDR's early life, "A First Class Temperament" is, by far, the most comprehensive treatment of his physical and mental battle with polio (see for, instance, p. 731). One important point needs to be made about the above. This type of behavior with respect to his polio flies in the face of Howard Bruenn's later assertion that FDR showed no concern for his physical problems. Nothing could be farther from the truth. 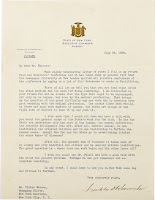 This 1929 letter is an excellent exposition on FDR's attitude about the medical profession. In the end, Roosevelt's last great obsession, to succeed where Woodrow Wilson had failed, in cementing his legacy for the future of the world by creating a lasting world peace organization (he would clearly have reveled in what President Obama did last week in chairing a meeting of the security council) is a key to understanding his behavior in 1944- running for a fourth term knowing he would soon die, as well as not putting much consideration at all into his choice for vice-president nor including him in the inner circle of his advisors. *the callous way he eventually disposed of McDonald when he longer needed him (a la Earl Looker, see page 48 of the book) speaks to another, less meritorius aspect of the FDR personality. 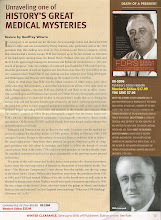 The scenario of the deceit surrounding FDR's profound anemia is discussed in detail in our book (see page 60). Here is the official account of the news conference on May 5, 1941, the day we came perilously close to President Henry Wallace. Here is the back of the photo that appears on page 122 of our book, listing the names and titles of the men in the photo. Ross McIntire utilized the "creme de la creme" of the medical and scientific community on his many panels. 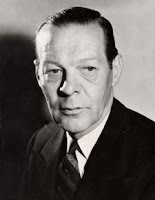 Walter Dandy, for instance, was one of the world's leading neurosurgeons (though Winchell McKendree Craig, then at Bethesda and longtime chairman of Neurosurgery at the Mayo Clinic, was FDR's neurosurgeon). One of the members of another of these special commissions was William Calhoun "Pete" Stirling. You can see that this photo is dated from 1942, long before Lahey allegedly first examined FDR. The real date of his first exam is unknown. Harry Goldsmith mentions a possible exam in November 1943 in his recent self-published book "Conspiracy of Silence", though there is no reason to believe that even this was the earliest time FDR saw Lahey. The myth that McIntire was incompetent and did not use adequate expertise in treating FDR has not been adequately refuted. Ross McIntire did what he did at the behest of his commander in chief, knowingly and unselfishly sacrificing his future reputation for the sake of the duty and honor of his position. Here's the article I (SL) wrote for Navy Medicine in his defense. You will read in our book about how the train of events to suspect melanoma occured, beginning with the 1961 paper of Dr. F. Massie (other than as one of the many rambling and often incredible assertions of Emanuel Josephson in 1948), based on a slide in a paper presented at a 1949 conference, that turned out not to be FDR's brain at all. Here is the slide that started it. Even more coincidentally, the fatal tumor is in the right parietal lobe of the brain, just like the one that was the source of the hemorrhage that killed the President. Until recently, Howard Bruenn's 1970 paper has been considered the unimpeachable last word about FDR's health. Our analysis in the book documents example after example of inconsistencies, purposeful exclusions and outright falsehoods. Here's the documentation to support one of them. 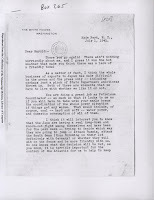 As you can see in the paper above, the second paragraph of the begins by unequivocally stating "I (Bruenn) first saw President Roosevelt professionally in March 1944". Here are two letters from 1946 that explode this myth. 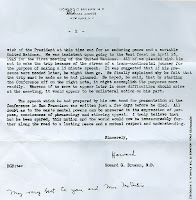 A correspondence between Ross Mcintire and Howard Bruenn. 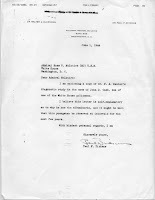 Bruenn's letter is in response to Mcintire's request for his thoughts to include in his 1946 book "White House Physician" (In fact, the two year period of treatment appears in the book as well). You can also see how well Bruenn understood FDR's driving desire to establish the United Nations. So you can now easily see that the myth of Howard Bruenn's first exam of FDR occurring on March 28th, 1944 only came to after he became the keeper of FDR's deadly secret. Here is Howard Bruenn's original evaluation of Eleanor Roosevelt in May 11,1943. Shortly after he was stationed at Bethesda and probably about the time he actually first saw FDR. March 28th 1944 was not the first time that Howard Bruenn saw FDR though it was probably about the time that he realized that FDR had deteriorated to the point that if he didn't attend to him on a daily basis and more aggressive treatment undertaken, he would not survive even to live out his third term. 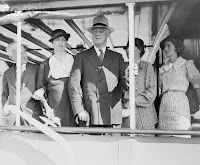 Therefore, it necessitated that he come out of the shadows and reveal his presence to others outside the most inner circle of FDR's confidantes who saw FDR on a daily basis. 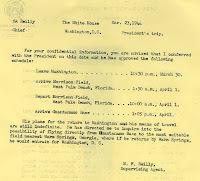 As to March 28th being the date FDR's "wholly unsuspected" cardiac problems were diagnosed and shortly afterwards necessitating a period of "rest and relaxation", here is the itinerary for the planned trip to Guantanamo dated March 23rd. Much more about this particular deception, among many deceptions, is in our book. The references to the prostate and the left maxillary antrum have been eliminated. It is not difficult to surmise why. Now you see it.... Now you don't! Probably the best way of all to appreciate the disappearance of the pigmented lesion above the left eye of FDR is watching it in videos. 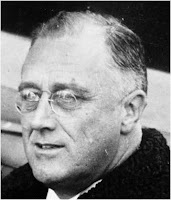 Especially between 1936 and 1940, newsreels reveal the starkly obvious lesion, accentuated even more by FDR's habit of raising his eyebrows while speaking. Only because FDR was the most photographed person on earth and the lesion was in an area that could not be hidden can this remarkable video record be created. It is just not possible to determine when, and how many times, the lesion was operated upon by Ross McIntire. A few days were needed away from the glare of the public and press for the area to calm down after being surgically manipulated in some fashion. There were many opportunities for this to have happened. Many of the daily visits to the White House doctor's office were likely devoted to treating and soothing the area, which surely must have been chronically inflammed. Much of the "sinus" treatment was probably just another smokescreen necessitated by the deadly secret. What can easily be seen, though, is by the time of the "Arsenal of Democracy" speech on December 27, 1940, even accounting for the use of make-up (pancake makeup was invented by Max Factor in 1935), the lesion is noticibly lighter. Also, note again, that FDR's hands do not leave his side. After this, the difference is unmistakable. In all videos from 1941 and forward, the lesion is, at most, a faint shadow of scar tissue. Amazingly, what had been a prominent facial feature had disappeared without any public notice. 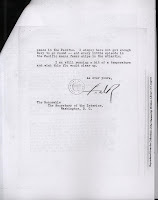 Only one record exists that the pathologic potential of the lesion was noticed at all- the January 1940 letter of Reuben Peterson (see the book for details). As stated by the eminent dermatologist, the late A. Bernard Ackerman, in our paper in the Archives of Dermatology, there are only too possibilities, based on physical characteristics, that this lesion could be: Solar Lentigo (aka sunspot or senile keratosis) or Melanoma. Even more relevant, while rarely these lesions may spontaneous regress, the natural history of either of them is incompatible with its disappearance over so short a time. Therefore, within any degree of medical probability, the lesion was intentionally removed. What you have just seen is the unequivocal objective evidence of that removal! Franklin Roosevelt did not personally deliver his 1945 State of the Union address to congress as had been his custom until 1943 (In 1944, he begged off because of "the flu", perhaps partially true) Instead, on January 6, he transmitted it to congress and spoke to the nation over the radio. The reason is quite clear. By this time he was incapable of standing anywhere near long enough to give the 15 page, 8,253 word speech standing on the podium of the House of Representatives. He had to marshal his strength for the upcoming inaugural for which he absolutely had to stand to deliver an abbreviated address (the shortest in presidential history). January 1945 was not the time for FDR to reveal to the world, for the first time, his increasingly debilitated condition. He needed to continue his image of strength for the inauguration, and, even more importantly, for his upcoming trip to Yalta. Instead, it was decided that a short newreel video would be done, under the most optimal of conditions, to speak to America. Make up artists and lighting specialists were brought in from Hollywood to optimize the appearance of president's wan complexion and cachectic body and the production was made. The video is divided into three carefully edited excerpts, but there is still much to be seen knowing that from this time FDR was struggling with his vision, most probably from a metastatic brain tumor in the right posterior portion of his brain. Even before he begins speaking, watch carefully and you will see that he uses his left hand to mark the place on the page from which he is about to speak. Soon afterwards, be begins to use his left hand as a stylus to keep his place. He stumbles over the word "numbers" than accentuates the words "places" and "times" to try to cover his initial hesitation. In the second excerpt, he again uses his left hand to mark his place and after the phrase "war torn world" then uses his right hand as a marker, crossing it over his left. In the third excerpt, he abandons all pretense and is essentially reading the text following his left hand along the page. Here is a color still photo of the speech. In contrast, here is a video of FDR speaking in October 1944, less than three months prior to the State of the Union video. There are a few minor stumbles, but his hands remain at his side. The contrast is remarkable. On March 1, 1945 FDR give the worst performance of his life during his speech to congress, deviating from the prepared text, (according to the New York Times, 49 times, we never counted) due to a primarily left sided visual deficit. On April 12, he died of a massive cerebral hemorrhage emanating from the right posterior portion of his brain- the area that controls the left side of vision. Do FDR's Medical Records Exist? The Case For. In our book, we do not go against the conventional wisdom that FDR's medical records were destroyed by Ross Mcintire. If this was the case, though, we firmly believe it was done to honor the expressed wishes of the most powerful and charismatic man of the twentieth century rather than to cover any alleged incompetence of his physicians. In fact, the bulk of the medical records that do exist document the only incident, in our mind, that Ross McIntire was indeed asleep at the wheel, permitting FDR's hemoglobin to fall to the nearly fatal level of 4.5 grams in May 1941 (America was perilously close to President Henry Wallace at that time). So I ask, if Ross Mcintire didn't destroy those records to cover his real mistake, why would he later destroy records to cover himself? One possible reason they weren't destroyed is that Eleanor already knew about it, as witnessed by her strikingly specific letter to Anna at the time the problem occurred (so much for the myth that she didn't care about "physiology"). She would never have even found out that much if FDR didn't tell her himself, most likely because neither he nor his doctors actually knew the reason why it occurred and didn't feel it was related to the deadly secret (though it most likely was- to our thinking, induced as consequence of the radiation he received). The story of the famous safe at the hospital, and who had access to it, is well known, as per Howard Bruenn's version (the only one anybody ever quotes, as per the 1970 "gospel"). The story is in the book, but we are still unclear as to why the records that McIntire supplied to Eleanor were only the selected ones we have examined. As an opposing view, there is a strong case to be made that the records were not destoyed. The prime evidence here is FOIA file DFI-1259, obtained by Ken Crispell and Carlos Gomez for their 1985 book "Hidden Illness in the White House" (see p. 254). Ken Crispell has died and Carlos Gomez (currently a hospice physicisn in the Washington, D.C. area) has no idea where the original document is. The document, dated November 17, 1981, from the chief legal officer of the National Naval Medical Center at Bethesda states unquivocally that FDR was a patient there 29 times and lists all the known aliases FDR was treated under! Considerable efforts to locate the legal officer have not met with success. 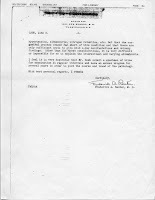 Many of the aliases on the document correspond to those on existing records, but others do not, and some documents have names that are not on the list, most notably F. David Rolph, that appears on nearly all the documents from the time of the anemia in 1941 (though close names, like Rolph Frank, for which we have no records, are on the list). The obvious question: Where did the chief legal officer get the information from? There is only one answer- the allegedly "lost" medical file. More corroboration for the exisistence comes from numerous conversations with a physician who was at Walter Reed in the late 1970's. The physician wishes to remain anonymous, but, trust me, he/she, who we shall call Dr. X, exists and appears credible. As the story goes, Dr. X was nosing around the hospital at the time working on another project (prune bellies, to be exact) and came across a VIP file that intrigued them. It had various reports and x-rays, some of which were photocopies, with different names though all with the same accession number! This immediately aroused Dr. X's suspicion that they were those of FDR. Upon further inspection, they appeared to be of someone who was being treated for, among other things, a urological malignancy. Included in these records was a retograde pyelogram (see "John Cash" in the previous post) showing an abnormality of the left kidney (ibid). Also noted incidentally was a severe metastatic lesion eroding the L3 vertebral body and that the level was somewhat difficult to surmise due to the presence of a "transitional vertebra". 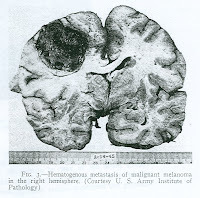 Aside from the fact a the metastatic lesion of the spine would be quite consistent with either melanoma or prostate cancer, it provides an alternative explanation for the severe pain FDR was experiencing at Bremerton, Washington in August 1944 and even moreso for the incident described by son James at his fourth inauguration in January 1945. If one looks at the John Cash letter, Dr Reuter also describes an anomaly of the left kidney and "six lumbar vertebrae" another term for a transitional vertebra, a fairly rare developmental anomaly of the spine. Therefore, either this is one of the greatest coincidences in medical history, or Dr. X was looking at FDR's x-rays! The alternative take to Howard Bruenn's story is that the records do indeed exist and are not destroyed, but presently lost under one of FDR's many assumed names or no name at all. If they are anywhere, they are in St. Louis at the national records center (That's where all documents older than 10 years wind up these days). When thinking about the whereabouts of FDR's medical records, I envision the last scene from George Lucas' great film "Raiders of the Lost Ark". The records are right next to the holy grail!!!! What was the Cause of FDR's Malignant Hypertension? This one may be two technical for non-physicians and was clearly too controversial for the book, but its a line of thinking that has come from many years of research. I give all the credit here to Dr. Barry Wiener, a brilliant educator and nephrologist at Jersey City Medical Center, whom I had the privilege of working beside for three years. Over the years, we had many conversati0ns around the etiology of a low grade proteinuria (seen repeatedly and consistently from 1939) FDR had, as documented by many surviving reports of urinalyses. First described by Luxton in 1952, it documents a clinical course entirely consistent with that of FDR. So, it is entirely possible (I won't say probable here) that malignant hypertension well documented that FDR had at least from March 1944 on, may have been, in large part, a consequence of the radiation therapy he received for his prostate cancer in 1940 or even before. This, of course, was superimposed upon his relatively mild and intermittent hypertension seen as early as 1933, his 2 pack a day use of tobacco use and a history of childhood nephritis from rheumatic fever. The whole thing fits like the proverbial glove and raises the question of when the diagnosis of prostate cancer was made and when it began to be treated. Obviously, FDR's physicians could not have known about a condition that was described seven years after his death! While kidney pathology from radiation is decribed in Behrens' 1949 textbook, there is no mention of the clinical course as described in 1952. We do not believe that it is at all a coincidence that Roosevelt's radiologist, one of the inner circle of his physicians, Charles F. Behrens, was the editor of the first textbook on the effects of radiation on the body, "Atomic Medicine", in 1949. There is more smoke here. 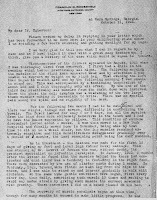 A letter appears at the FDRL (Box 6, McIntire Files) from internist Paul Dickens, another of the inner circle doctors, forwarding a letter from Doctor F.A. Reuter to Ross Mcintire about "John Cash", allegedly the son of a White House policeman, concerning a remarkably extensive and invasive workup for low grade proteinuria (protein in the urine that is normally not seen). The question arises that, on the face of it, a young man underwent a "million dollar" workup for a benign condition that affected many thousands of children from exposure to rheumatic fever (as had been FDR). It seems like "much ado about nothing" for a child, but it wouldn't have been for the president of the United States. In fact, our research indicates that there was a White House policeman at the time named John Cash. 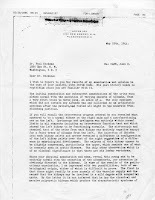 On the other hand, John Cash is one of the thirty plus known aliases to have been used by FDR and a 1944 laboratory report found in the FDR papers at the FDRL carries this name, as well as documenting a profound (4+) proteinuria (incidentally, never reported by Howard Bruenn despite the fact that he undoubtedly saw it). The March 10th date is also interesting. This result, over two weeks prior to Bruenn's alleged first exam and just about the time that Ross McIntire decided that FDR needed a vacation in Cuba rather than meeting with Winston Churchill to plan the invasion of Europe, surely would have raised some concern but not a whiff of it appears anywhere. This is just one of the fascinating and frustrating aspects of the layers of smokescreen laid down to cover FDR's Deadly Secret. More to come!